As energy efficiency continues to be a fascination for the armed forces, the US Department of Defence has responded with a plan. Liam Stoker examines the Operational Energy Strategy: Implementation Plan, released in March 2012, and looks at how the nation can reduce its reliance on fossil fuels, including using photovoltaic cells and microgrids. The Mobile Solar Power system is capable of reducing by 50% the fuel consumed by each marine every day, while also reducing battery weight. Image courtesy of NRL. Research into the Solar Soldier programme found that photovoltaic cells could be put to far more efficient use within bases. Image courtesy of ESPRC. 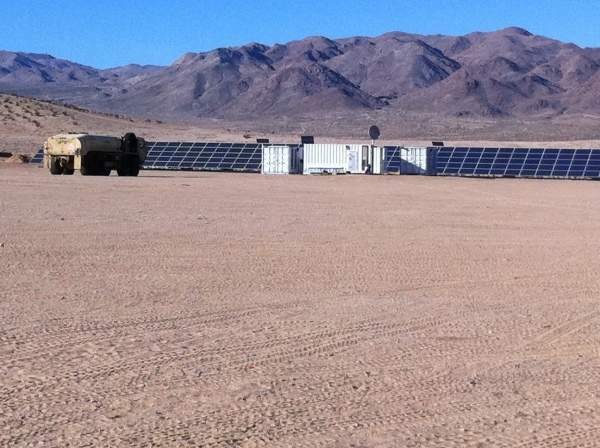 A microgrid being tested at Fort Irwin before being shipped to Afghanistan. Image courtesy of Dennis Simon. 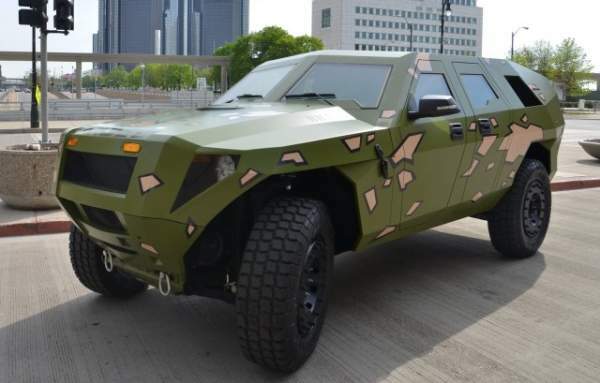 TARDEC's new hybrid Humvee, the Fuel Efficient Demonstrator Bravo. Eco-efficiency is very much a continuing trend for armed forces across the globe. Reducing an army’s carbon footprint is now almost as important as reducing its operational costs. "Mobile Solar Power uses multiple single-junction solar cells with a power conditioning circuit which maximises array power production." However, with the global economic climate placing significant strain on resources, just how can a nation’s armed forces expect to count costs as well as carbon emissions? In order to do so, the US Department of Defence needed a plan. Released in March 2012, the Operational Energy Strategy: Implementation Plan highlighted a number of near, mid and long term goals with a view to attaining a far more efficient future for the armed forces. Although the document outlines the ultimate goal as "energy security for the war fighter – to assure that US forces have a reliable supply of energy for 21st century military missions", it also highlights that all branches of the armed forces must contribute, right throughout the army, the air force and the navy. One such way that the navy is looking into increasing its energy efficiency is through the use of adapted photovoltaic cells. US Naval Research Laboratory (NRL) Electronic Science and Technology Division researchers, working in partnership with MicroLink Devices, Design Intelligence and the USMC Expeditionary Energy Office, have produced Mobile Solar Power, a means of recharging a Marine’s batteries by attaching them to a solar panel. Robert Walters, NRL Solid State Devices Branch head, said: "One of the most significant challenges currently facing the Marine Corps is the need to supply sufficient electricity to individual Marines in FOBs. Mobile photovoltaics are a technology that can address these needs by leveraging emerging, flexible, high efficiency photovoltaic technology." 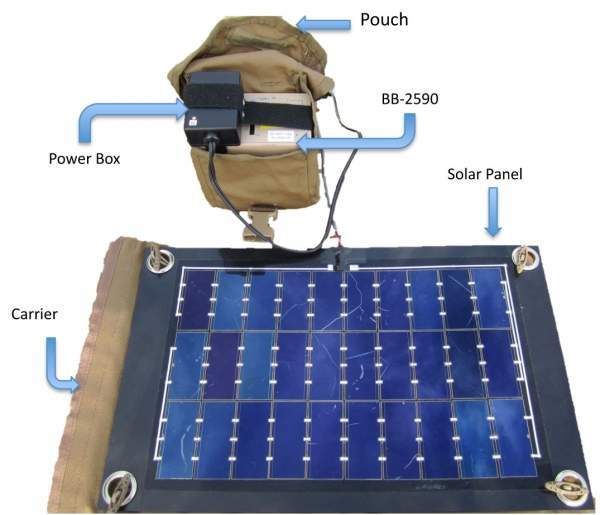 Mobile Solar Power uses multiple single-junction solar cells with a power conditioning circuit which maximises array power production, and is used to charge a standard, military issue lithium-ion battery. The system can be equipped with a 10.5in x 15.5in solar panel to generate 11W under 1-sun air mass of 1.5 illuminations. Produced in response to findings which indicated that solar is the only renewable energy source capable of meeting the navy’s requirement to reduce fuel and battery resupply, MSP is capable of reducing 50% of fuel consumed by each marine every day, while also reducing battery weight. Mobile Solar Power’s premise bears a striking resemblance to the Solar Soldier programme, a notion that was originally proposed in 2011. 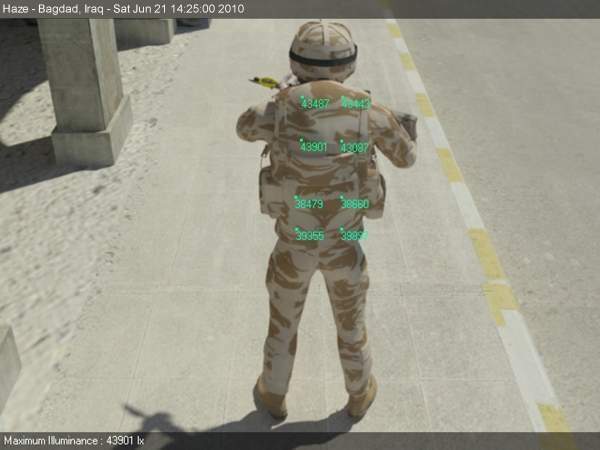 Solar Soldier focused around small solar cells stitched into the combat uniforms of deployed soldiers, allowing power to be generated while out on patrol. Devices could then be plugged into these cells to power them without the use of batteries. "One such way that the navy is looking into increasing its energy efficiency is through the use of adapted photovoltaic cells." The project received funding from the UK Ministry of Defence and the Engineering and Physical Sciences Research Council, but doubt has been cast over the system’s reliability. The generated power was also unpredictable, with anywhere between 30-50w typically produced. Panels also demonstrated signs of degradation, with a 20% loss of performance recorded during testing in Cyprus. The results led to Duncan Gregory, a University of Glasgow professor, determining that the system needed considerable work before it was considered ready for the battle field. "The Solar Soldier project needs significant investment and investigation before it can be used in missions." Research into the use of photovoltaic cells did, however, uncover a far more viable potential use. "The Solar Soldier project could, perhaps, have the biggest impact on bases rather than dismounted soldiers," confirmed Gregory. Of specific interest in the US Department of Defence’s plan is increasing the army’s efficiency through a radical rethink of how it powers its bases and installations. One such goal highlighted in the report is to have 16 net-zero energy / waste / water installations by 2020, and 25 such installations by 2025. The Olympic Games is at risk from terrorist attacks on a number of fronts, all of which must be secured seamlessly. Working towards this aim, the US Army Research, Development and Engineering Command (RDECOM) is currently in the process of developing renewable energy-based microgrids designed to power communication systems in remote combat outposts. Microgrids allow the integration of new energy sources, such as wind turbines and solar panels, to collaborate with existing sources in order to increase efficiency. The Reusing Existing Natural Energy from Wind and Solar (RENEWS) and Renewable Energy for Distributed Undersupplied Command Environments (REDUCE) programmes have been worked on by RDECOM’s Army Research Laboratory in collaboration with the Natick Soldier Research, Development and Engineering Center (NSRDEC), with prototypes currently undergoing operational assessments at the National Training Center located at Fort Irwin. Marnie de Jong, RDECOM Communications – Electronics Research, Development and Engineering Center electrical engineer, said: "The RENEWS system is completely renewable energy with solar and wind components. It’s meant for smaller, mostly communications systems in very remote locations that are difficult to get to re-supply fuel or might be dangerous. It would be a self-sustaining system." The New York Times has reported that the Demonstrator Bravo is capable of 8.2 miles a gallon (mpg) during city operations. If the Department of Defence is to meet its obligations set out in the plan, then it will need a significant contribution from its fleet of vehicles. Ongoing tests with various mixes of biofuels are demonstrating one such method, but the US Army’s Tank Automotive Research, Development and Engineering Center (TARDEC) may have developed a system that can not only contribute towards environmentally friendly vehicle operations, but also towards RDECOM’s REDUCE programme. "Microgrids allow integration of new energy sources, such as wind turbines and solar panels, to collaborate with existing sources to increase efficiency." TARDEC’s hybrid Humvee, the Fuel Efficient Demonstrator Bravo, combines a 4.4 litre twin-turbo Ford V8 268hp engine with a parallel hybrid drive system, resulting in the vehicle using 70% less fuel than the standard design Humvee. The New York Times has reported that the Demonstrator Bravo is capable of 8.2 miles a gallon (mpg) during city operations and 14.2mpg during highway operations, double what the standard Humvee is capable of achieving. The Demonstrator Bravo doesn’t sacrifice protection for eco efficiency either. 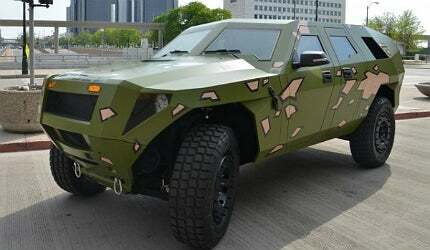 An armoured cab sits atop a tubular space frame, designed specifically to increase rigidity to weight ratio, while a V-shaped hull is designed to deflect IED blasts away from those onboard. Bravo’s parallel hybrid drive system doesn’t just make the vehicle environmentally efficient to maintain, however. The vehicle’s batteries can also be plugged into microgrids at small operational outposts, feeding them with power with which to operate. Coupled with the plug-in adaptors for renewable energy sources, small outposts could soon be powered almost completely independently of fossil fuels. Whether or not the US DoD can meet its obligations while retaining operational readiness, however, remains to be seen. Defence budget cuts and a first drop in US spending since 1998 ensured military spending in 2011 didn’t exceed $1.738bn. 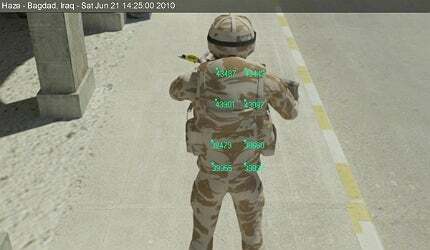 Forecast spending for 2012 has been lowered as government officials confirm the UK will pull out of Afghanistan by 2014.